Contact lenses are one of the best advancements in modern medicine, and most definitely in the world of optometry. But if you’ve never worn contacts before, the idea of sticking your finger into your eye to put in and take out a foreign object can be intimidating, to say the least. Fear not, removing your contacts is a breeze! As with anything, taking your contacts out will become much easier once you’ve had a little practice at it. If you are struggling at first, don’t panic. It is completely normal to have a hard time getting used to removing your contacts – and putting them, for that matter. To help you get accustomed to the ins and outs of wearing contacts, we’ve put together a list of our favorite tips for how to safely remove your contacts. If you have any questions or if something is unclear, don’t be afraid to reach out! The entire staff at First Eye Care DFW would be happy to answer any questions you may have and will do what we can to help you get the most out of your contact-wearing experience. Before you take out your contacts, it is absolutely imperative for you to wash your hands with soap and water. Any dust, dirt, or bacteria on your hands could easily get transferred to your contacts, leading to an infection or discomfort, at the very least. To ensure your contacts are comfortable and can do their job, you must have clean hands when handling them. Be sure and dry your hands after you’ve washed them, as you want to reduce the amount of water that gets onto your lenses. Be very gentle during this process! It really is quite easy, once you get the hang of it. If you find that another method makes more sense to you, go for it. The important part is to make sure your hands are clean, and you handle the contacts with a great deal of care. The last thing you want to do is rip or damage the lens in any manner when removing it from your eye. 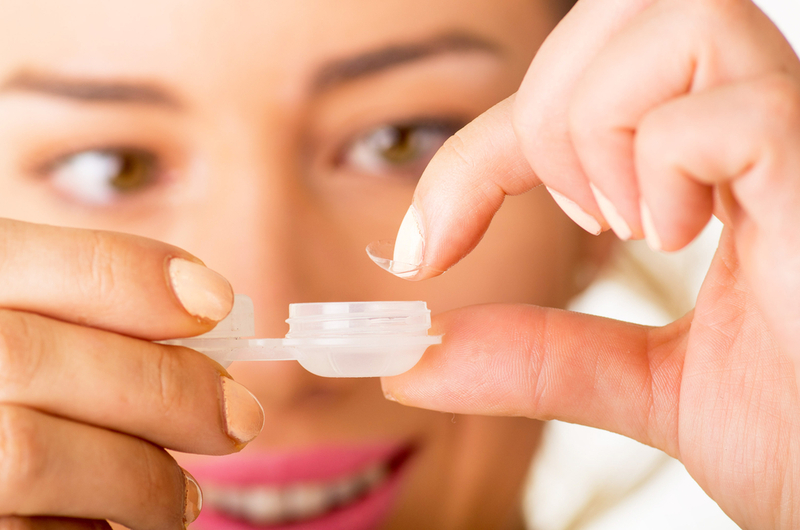 Always store your contact lenses in a clean case with fresh solution, as old contact solution can contaminate the lens. If you have any questions about this or would like us to walk you through putting in and removing your contacts, please do not hesitate to contact First Eye Care DFW today. There is nothing to fear with contact lenses, especially if you take the time to learn how to properly handle them. What Are Progressive Lenses and How Can They Help You See Better? Should You Buy HD Lenses with Your Eyeglasses? Please fill in the form below!